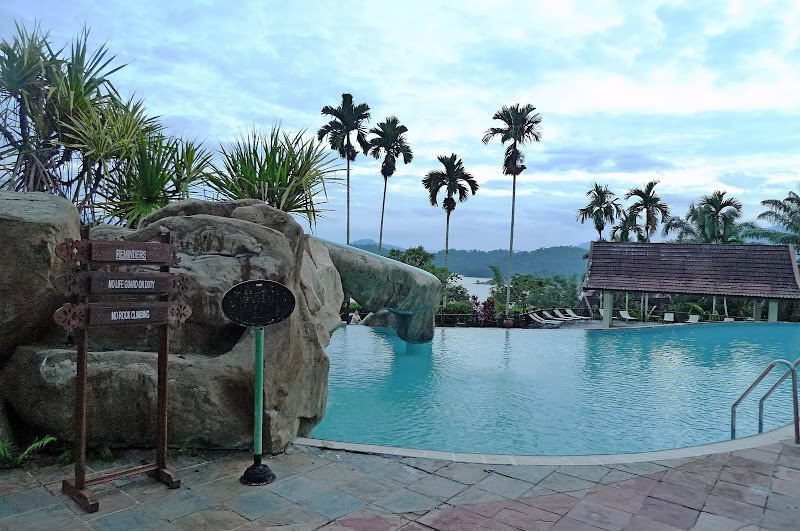 My blogger friend and travel partner could not stop raving about the infinity pool at Kenyir Resort and Spa. 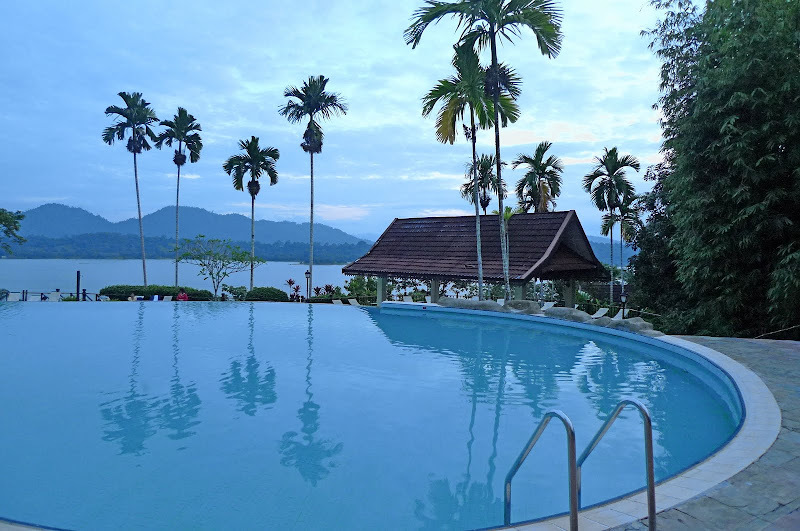 I thought it was really nice too especially when you can't see the edge of the pool as if the water extends all the way to merge with Lake Kenyir in the distance. This is the lower part of the swimming pool. Can you see the water flowing down from the upper pool? And this is the children's pool. 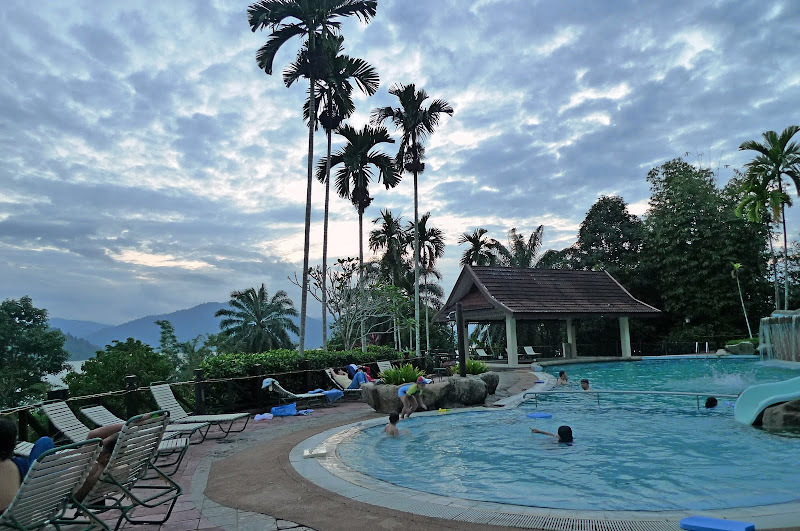 In the background is the Main Building of the Kenyir Resort. 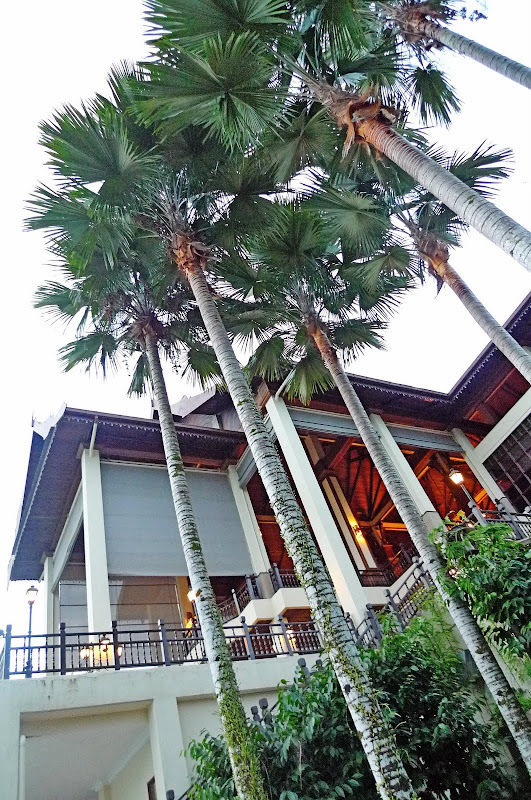 This is the view of the Main Building of Kenyir Resort from where I stood at the swimming pool area. I love those trees! They were really tall! 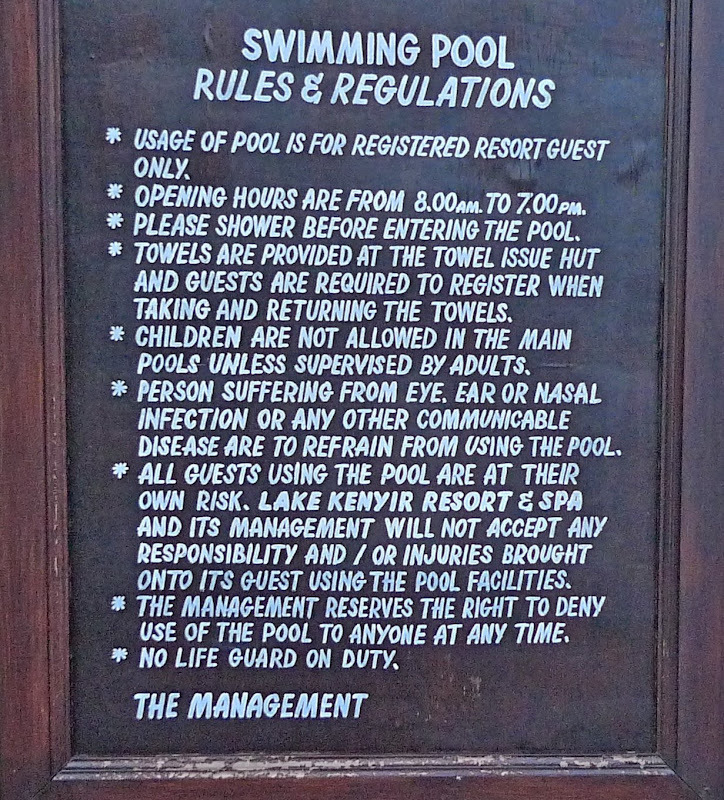 I took a shot of the Rules & Regulations set by the management for people using the swimming pool although it's not like anyone would bother to read it. Haha! 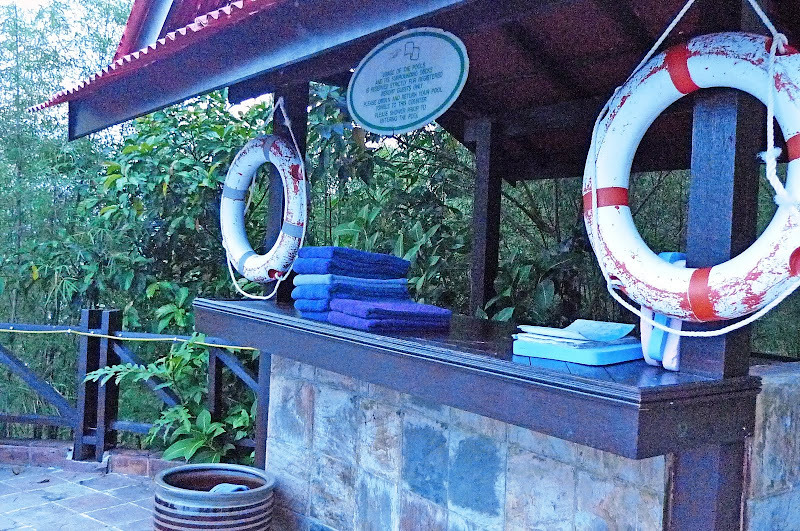 Towels were available at this hut. But swim at your own risk as no life guards are available! I like the ambience here. 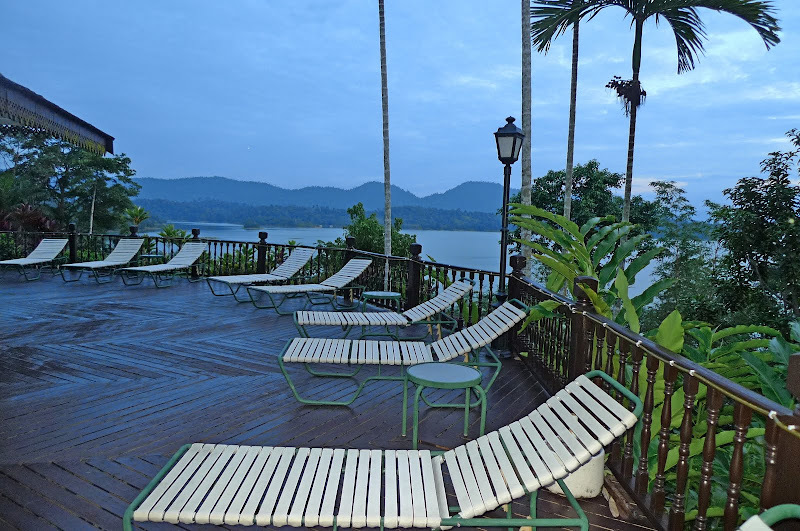 It's nice swimming or just relaxing by the poolside with the beautiful Lake Kenyir as the backdrop. It was getting dark. Most people had left the pool. My stomach was making noises. I guess it's time for dinner! ANd here are the night owls! hehehe! Hmmm a tad bit late for fc! sayang! Nice pool, but where are the scantily clad bikini babes? Looks like a really beautiful relaxing place to be. The pool is absolutely stunning! I could just swim the whole evening away! wow, cool!! 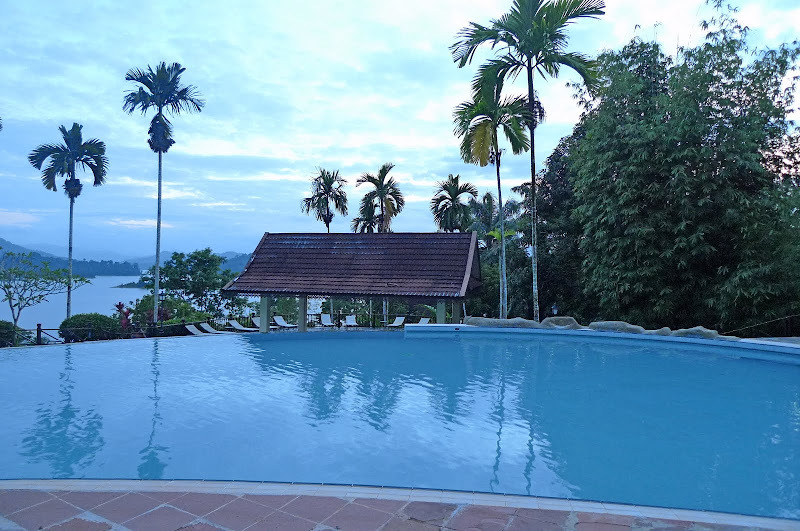 i always like those infinity pool, it just makes us feel so much freedom swimming inside without "borders"..
and is that infinity pool directly facing the sea?? mariuca, congrats for being FC! Wow! That's 4.31am! You still awake? 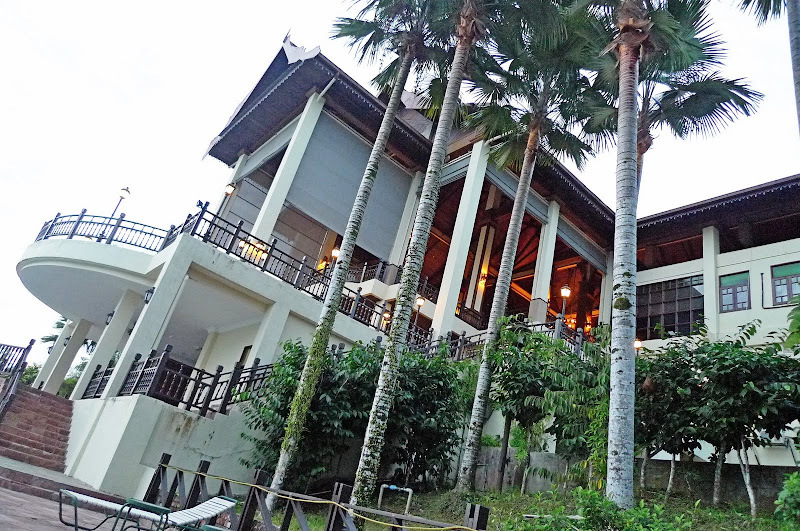 Play your PSP and sipping mocktail by the poolside? Wow! I would love to do that everyday! Haha! You love the design of the pool? That's good coming from you - the expert! Haha! manglish, so you and fufu can go together to Kenyir for holiday! Both also 2 years later, haha! ladyviral, so are you going to suggest this place for your company trip? Haha! SK, yes the pool directly faces the lake. Not the sea, haha! No sea there. Yes, lying beside the pool is definitely relaxing. But I don't want suntan - so very happy it's not too sunny! Actually, it was near to night time, that's why photos looked a bit gloomy, haha! che-cheh, I don't know how to swim and there is no life guard there. Can't depend on my friend to save me, right? Haha. gallivanter, that's nice! Didn't blog about it? such nice pool..should swim in it.. 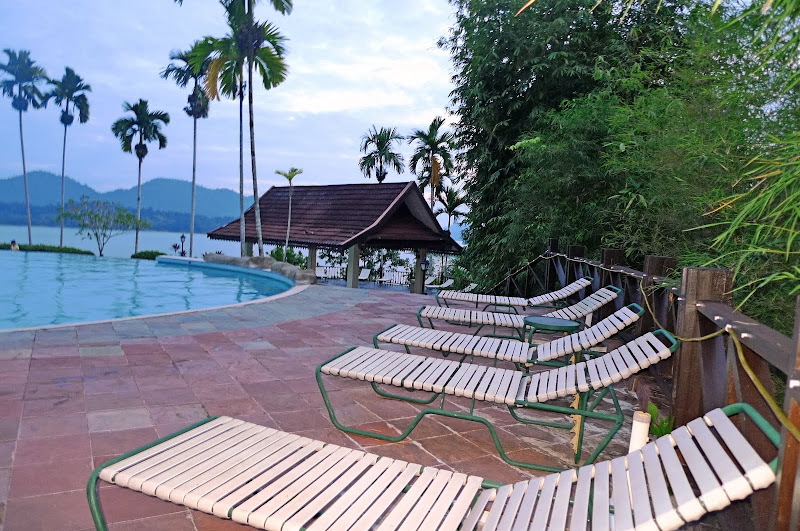 If you didn't mention that the edge of the pool extends all the way to merge with Lake Kenyir, I wouldn't have noticed it! It is absolutely a gorgeous view and how relaxing to sit in the pool and have the lake as the open view? There's a house, no mansion, south of my city with a backyard pool with no edge and it looks like the water flows down into the hill (the house sits on a hill). Where is Kenyir Resort by the way? Why, it looks like my Hawaii home! Aiyo foong! We have such lovely place right here in our own country and yet I'm not aware of it..
lina, haha! I've seen people doing that in a condo swimming pool! Can you imagine that! jam, I can float on water for a few seconds, then it's down all the way! Haha! merryn, yes, sometimes we think overseas are nicer but actually there are some local places that are just as nice! How to tweet using your handphone? First, you must make sure your handphone can access the internet. If not, find out how from your service provider. After that, it's a matter of going online to Twitter site and start tweeting! Easy as ABC! 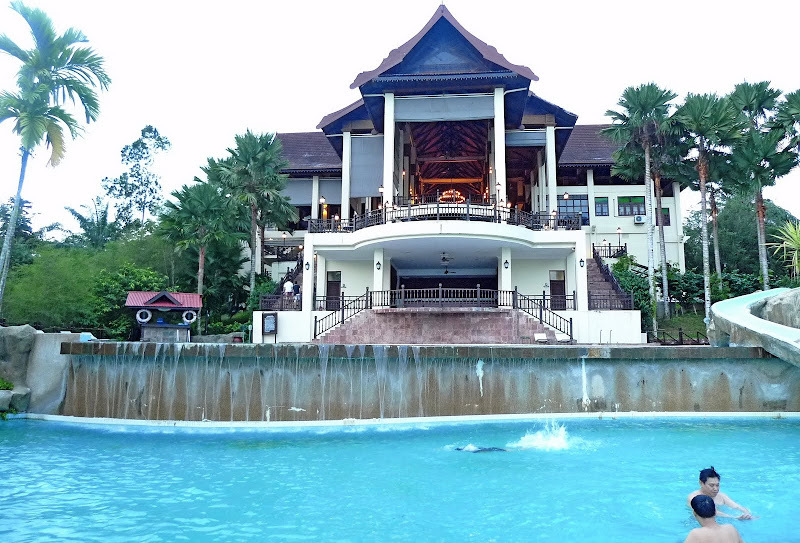 The pool looks good and the resort looks nice too. I'm surprised, hehe.. The pool is so cool! I so want to swim in it! 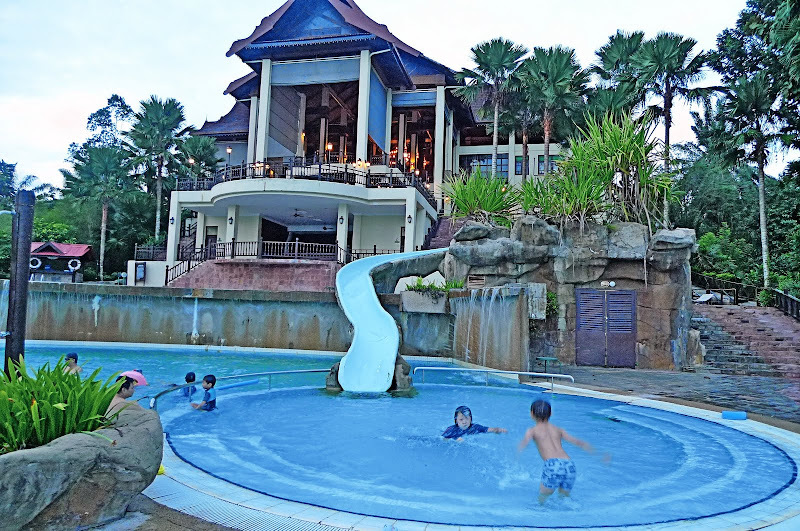 It is such a beautiful resort. I'll be able to relax and have a good rest here. TZ, nothing special about the small hut. I just took a photo of it. Haha! kyh, didn't "jump" I slowly release myself into it. Hahaha!